Recognizing the pressing need for techniques helping human beings to overcome the stress caused by our way of living in the present century, Yogi Bhajan came to the West in 1969 with a stated purpose: to create teachers, not to gather disciples. He travelled for 30 years around the globe to fulfill his purpose. "Happiness is your birthright" was the founding principle of the 3HOorganization, that Yogi Bhajan created in his early American days. And "3H" stands for the three words: "Healthy, Happy, and Holy". Yogi Bhajan's motto was "It's not the life that matters, it's the courage that you bring to it." His bottom line, printed on the back of his calling card: "If you can't see God in all, you can't see God at all." And Yogi Bhajan lived it well. 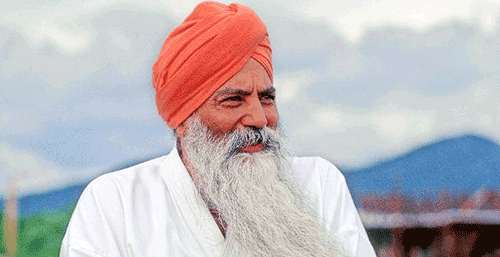 Yogi Bhajan was born Harbhajan Singh Puri in India on August 26, 1929. During early childhood he learned at the knee of his saintly grandfather. When he was eight he was sent to study with the great Master, Sant Hazara Singh, under whose unrelenting tutelage the boy mastered Kundalini Yoga when he was 16 ½ years old. During the partition of India in 1947, young Harbhajan's village had to be evacuated because it was to become a part of Pakistan. Still a teenager, his leadership ability already recognized, he was put in charge of bringing more than a thousand people to safety in Delhi, traveling through many dangerous miles of country in violent upheaval. Please, read more on 3HO and also on the Library of Teachings.